However Improbable: "Then she knew her attacker." "Or she paid someone to murder her. But now that I hear your idea I like it better." "Then she knew her attacker." "Or she paid someone to murder her. But now that I hear your idea I like it better." B was harder then I thought it would be. One would think it would be simple, since it isn't X or something. (Funny thing, I have an X. And a Y and a V. But B....not so much.) In fact, I can't even think of a movie I've seen which begins with B. Probably when this post goes up I will think of a hundred and then I will mentally kick myself. But, since nothing is coming to mind and I've been thinking on it for hours, I will go with a movie I wish to see, but haven't had a chance to yet. When I saw the preview for this before it came out I thought one of the brothers was played by Samwise Gamgee. By then I was a huge Lord of the Rings geek so anything that any of the actors were in I wanted to see. On discovering it wasn't Sam I was disappointed, but by then I had seen the preview twice and my interest was pricked. And since then I've only become more interested in seeing it, thanks to Grimm. (The TV show.) Watching a movie about Nick's ancestors? Aye, can't go wrong there. Considering the fact it has now been out since 2005...I think it is time I finally sat down and watched it. I'll force one of my brothers to watch it with me, pay back for...there has to be something I have to pay them back for. This is not related to the challenge so those who are here for the challenge - you can skip this if you like. First, I was given an award from Jonnah. You can find her blog HERE! Thank you, dear! This is one of the easier blog awards - by that I mean I only have to answer three questions. 1. What famous person would you like to meet? I believe I have done this one before, or maybe one like it. Either way, I think I picked Josh Groban. I would pick him again, because he is that cool, but I should probably go with someone different. How about Jamie Bell. Because he is a huge Tintin geek, and played Tintin, and his hair does the Tintin thing. And we could go to the Tintin museum or something. 2. What is your favourite flower? I would say any but right now I am in that sneezing season where all flowers make me sneeze my head off. (Not that that makes me dislike them, it is just hard to smell them when you're sneezing.) Therefore I shall have to go with looks. I know girls say roses are cliche, but I think they are pretty. 3. What is your least favourite food? This second part is from Bella's blog at To Say Nothing Of Reality. You can find it HERE! 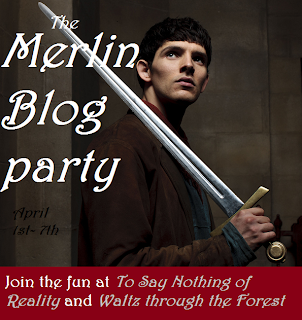 Bella is holding a Merlin Blog Party. And since this is Merlin, I couldn't resist. I had to join. You can find the rules on her blog. Day One, I believe - I hope I am doing it correctly - we are supposed to do a post on our favourite main characters. I am on season two on Merlin, but I have seen enough to have favourite character. I liked Merlin the moment I saw him - Arthur took me longer because he can be such a prat. But over time he grew on me, then he drank the poison to save Merlin's life. Then he went to save Gwen and Merlin found out he loves her and there was that funny scene of then not talking about Arthur's feelings as they walked. And now I just love these two. Merlin is one of the sweetest, bravest characters in TV history. He saves Arthur's life but it is rarely known. He willingly gets in trouble to keep Arthur out of it. And he can be completely ridiculous and fun. He can also laugh at himself, which few people do. "My name is Merlin, but most people call me Idiot." Also, he rarely complains about all of the work he has to do. He did once and felt bad for it later. Arthur tries to hide his feelings. He tries to act tough and - well, like his father - but his kind heart and concern for his people shows through often and even saved the kingdom once. Of course, he still has his prat moments - and walk away from a challenge? Take an insult? Not likely. But he is growing and I am excited to see him as king. What about all of you? Have you seen The Brothers Grimm? Do you have a movie you have been wanting to see for years? Have you seen Merlin? Do you have a favourite character? Quote is from Psych, when Woody tries to help Shawn solve a case. There is a reason Shawn is the detective and Woody works in the morgue. 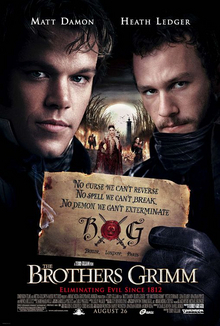 I was pleasantly surprised that I liked The Brothers Grimm...as I've never been a big fan of Ledger or Damon. I've actually eaten haggis... several times as a matter of fact. It tastes far, far better than the description of it would suggest, and I quite like it. *Far* and away better than the despicable hot dog! I MUST see Brother's Grimm now. Mime's right, it's on our we-need-to-watch-list, but haven't quite got there. I have never seen this movie but I am a HUGE fan of the TV show so I need to give this a watch! The only movies we get to see these days are on Netflix streaming - which shows how far out in the country we live! I have wondered if it was creepy, the witch or whatever she is has always looked so. But, as you said, some of us have watched Doctor Who. But thanks for the warning, it shall be nice to have a heads up so I won't be jumping too much out of my boots. I watch Merlin a lot xD I missed a handful of episodes in season five, but I plan to hunt them down and watch them sooner or later. And, by far, my favorite character is Merlin. The Brothers Grimm is one of my very favorite movies! You should definitely watch it! I haven't seen Brothers Grimm yet, either. I love Merlin, too!!! :) yay! I've seen Brothers Grimm! In the theaters even! And I too love Merlin (and Psych). Stopping by on the A to Z Challenge. I haven't seen the movie - more my son's taste. But like I always tell him - if it's a good story, it doesn't matter much what the genre is. Maybe I'll give it a go one of these days. Have fun with the A to Z - I'll have to stop back by and see what kind of movies are on your list. Blessings! I saw the Brothers Grimm once... a really long time ago. I remember loving both boys a lot.... but I think I was too young when I watched it. I have vivid memories of being horrified by the awful witch when she turned into glass and shattered... and the part with the kid turning into.... that gooey stuff. I shall have to re-watch it sometime and decide. lol. I TOLD Bella to wait until summer to do the Merlin thing. I only saw the first season and let's face it, that doesn't exactly go far with the plot or character development. I'm hoping to have it watched by summer.... but she wouldn't wait! The twerp. lol. Ooooooooooooooooooooooooooooh. I'd love to meet Jamie Bell too. He's pretty coolio. And he has a cool accent too. YOU DID IT RIGHT!!!!!!!!! :) I'd love to have a guest post by you. It'd be brilliant.